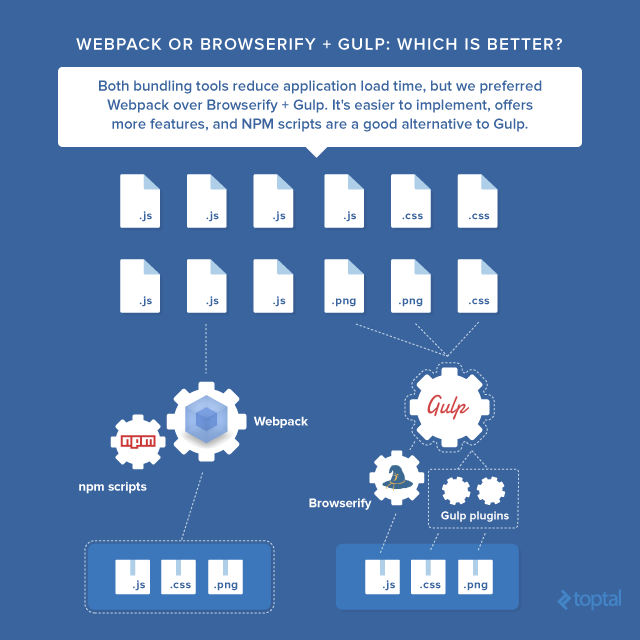 Webpack or Browserify & Gulp: Which Is Better? Eric is a full-stack developer specializing in front-end work using React, Node, and HAPI. His passion is cutting-edge technology. The web also provides some of its own unique development challenges. For example, since webpages make a lot of asynchronous requests, your web app’s performance can be significantly degraded from having to request hundreds of JS and CSS files, each with their own tiny overhead (headers, handshakes, and so on). This particular issue can often be addressed by bundling the files together, so you’re only requesting a single bundled JS and CSS file rather than hundreds of individual ones. Which bundling tool should you use: Webpack or Browserify + Gulp? Here is the guide to choosing. It’s also quite common to use language preprocessors such as SASS and JSX that compile to native JS and CSS, as well as JS transpilers such as Babel, to benefit from ES6 code while maintaining ES5 compatibility. This amounts to a significant number of tasks that have nothing to do with writing the logic of the web app itself. This is where task runners come in. The purpose of a task runner is to automate all of these tasks so that you can benefit from an enhanced development environment while focusing on writing your app. Once the task runner is configured, all you need to do is invoke a single command in a terminal. I will be using Gulp as a task runner because it is very developer friendly, easy to learn, and readily understandable. When my-first-task is performed, all the files matching the glob pattern /public/js/**/*.js are minified and then transferred to a build folder. The beauty of this is in the .pipe() chaining. You take a set of input files, pipe them through a series of transformations, then return the output files. To make things even more convenient, the actual piping transformations, such as minify(), are often done by NPM libraries. As a result, it’s very rare in practice that you need to write your own transformations beyond renaming files in the pipe. The next step to understand Gulp is understanding the array of task dependencies. Here, my-second-task only runs the callback function after the lint and bundle tasks are completed. This allows for separation of concerns: You create a series of small tasks with a single responsibility, such as converting LESS to CSS, and create a sort of master task that simply calls all the other tasks via the array of task dependencies. Finally, we have gulp.watch, which watches a glob file pattern for changes, and when a change is detected, runs a series of tasks. In the above example, any changes to a file matching /public/js/**/*.js would trigger the lint and reload task. A common use of gulp.watch is to trigger live reloads in the browser, a feature so useful for development that you won’t be able to live without it once you’ve experienced it. And just like that, you understand all you really need to know about gulp. Where Does Webpack Fit In? Why Are Developers Using Webpack Instead of Gulp? Webpack is a bundler whereas Gulp is a task runner, so you’d expect to see these two tools commonly used together. Instead, there’s a growing trend, especially among the React community, to use Webpack instead of Gulp. Why is this? Simply put, Webpack is such a powerful tool that it can already perform the vast majority of the tasks you’d otherwise do through a task runner. For instance, Webpack already provides options for minification and sourcemaps for your bundle. In addition, Webpack can be run as middleware through a custom server called webpack-dev-server, which supports both live reloading and hot reloading (we’ll talk about these features later). By using loaders, you can also add ES6 to ES5 transpilation, and CSS pre- and post-processors. That really just leaves unit tests and linting as major tasks that Webpack can’t handle independently. Given that we’ve cut down at least half a dozen potential gulp tasks down to two, many devs opt to instead use NPM scripts directly, as this avoids the overhead of adding Gulp to the project (which we’ll also talk about later). The major drawback to using Webpack is that it is rather difficult to configure, which is unattractive if you’re trying to quickly get a project up and running. The application will use React for the front-end. Originally, I wanted to use a framework-agnostic approach, but using React actually simplifies the responsibilities of the task runner, since only one HTML file is needed, and React works very well with the CommonJS pattern. We will cover the benefits and drawbacks of each setup so you can make an informed decision on what type of setup best suits your project needs. A straightforward HTML file. The React application is loaded into <div id="app"></div> and we only use a single bundled JS and CSS file. In fact, in our Webpack development setup, we won’t even need bundle.css. This acts as the JS entry point of our app. Essentially, we’re just loading React Router into the div with id app that we mentioned earlier. This file defines our routes. The urls /, /about and /contact are mapped to the HomePage, AboutPage, and ContactPage components, respectively. This can be thought of as the container for all our page views. Each page contains a <Header/> component as well as this.props.children, which evaluates to the page view itself (ex/ ContactPage if at /contact in the browser). This is our home view. I’ve opted to use react-bootstrap since bootstrap’s grid system is excellent for creating responsive pages. With proper use of bootstrap, the number of media queries you must write for smaller viewports is dramatically reduced. The remaining components (Header, AboutPage, ContactPage) are structured similarly (react-bootstrap markup, no state manipulation). Now let’s talk more about styling. Why is this approach so useful? It results in highly modular CSS, largely eliminating the issue of unwanted cascading behavior. Suppose we have two React components, Component1 and Component2. In both cases, we want to override the h2 font size. The h2 font size of Component1 and Component2 are independent whether the components are adjacent, or one component is nested inside the other. Ideally, this means a component’s styling is completely self-contained, meaning the component will look exactly the same no matter where it is placed in your markup. In reality, it’s not always that simple, but it’s certainly a huge step in the right direction. In addition to per-component styles, I like to have a styles folder containing a global stylesheet global.scss, along with SASS partials that handle a specific responsibility (in this case, _fonts.scss and _variables.scss for fonts and variables, respectively). The global stylesheet allows us to define the general look and feel of the entire app, while the helper partials can be imported by the per-component stylesheets as needed. Now that the common code in each branch has been explored in depth, let’s shift our focus to the first task runner / bundler approach. This comes out to a surprisingly large gulpfile, with 22 imports and 150 lines of code. So, for the sake of brevity, I’ll only review the js, css, server, watch, and default tasks in detail. // Bundles our JS using Browserify. Sourcemaps are used in development, while minification is used in production. This approach is rather ugly for a number of reasons. For one thing, the task is split into three separate parts. First, you create your Browserify bundle object b, passing in some options and defining some event handlers. Then you have the Gulp task itself, which has to pass a named function as its callback instead of inlining it (since b.on('update') uses that very same callback). This hardly has the elegance of a Gulp task where you just pass in a gulp.src and pipe some changes. When an HTML file is changed, the html task is re-run. The last pipe calls livereload() if the NODE_ENV is not production, which triggers a refresh in the browser. The same logic is used for the CSS watch. When a CSS file is changed, the css task is re-run, and the last pipe in the css task triggers livereload() and refreshes the browser. However, the js watch doesn’t call the js task at all. Instead, Browserify’s event handler b.on('update', bundle) handles the reload using a completely different approach (namely, hot module replacement). The inconsistency in this approach is irritating, but unfortunately necessary in order to have incremental builds. If we naively just called livereload() at the end of the bundle function, this would re-build the entire JS bundle on any individual JS file change. Such an approach obviously doesn’t scale. The more JS files you have, the longer each rebundle takes. Suddenly, your 500 ms rebundles start taking 30 seconds, which really inhibits agile development. The first issue here is the cumbersome vendor CSS inclusion. Whenever a new vendor CSS file is added to the project, we have to remember to change our gulpfile to add an element to the gulp.src array, rather than adding the import into a relevant place in our actual source code. The other main issue is the convoluted logic in each pipe. I had to add an NPM library called gulp-cond just to setup conditional logic in my pipes, and the end result isn’t too readable (triple brackets everywhere!). Let’s review our server code. This sets the base directory of the server and the port based on the node environment, and creates an instance of express. This adds connect-livereload middleware (necessary for our live reloading setup) and static middleware (necessary for handling our static assets). In a real backend, you would have an entire folder dedicated to API routes, separate files for establishing DB connections, and so on. This sample route was merely included to show that we can easily build a backend on top of the frontend we have set up. This is a catch-all route, meaning no matter what url you type into the browser, the server will return our lone index.html page. It is then the responsibility of the React Router to resolve our routes on the client side. This tells our express instance to listen to the port we specified, and open the browser in a new tab at the specified URL. Given that we are already using gulp-livereload in our gulpfile, this makes two separate places where livereload must be used. This is the task that runs when simply typing gulp into the terminal. One oddity is the need to use runSequence in order to get the tasks to run sequentially. Normally, an array of tasks are executed in parallel, but this isn’t always the desired behavior. For example, we need to have the clean task run before html to ensure that our destination folders are empty before moving files into them. When gulp 4 is released, it will support gulp.series and gulp.parallel methods natively, but for now we have to leave with this slight quirk in our setup. Beyond that, this is actually pretty elegant. The whole creation and hosting of our app is performed in a single command, and understanding any portion of the workflow is as simple as examining an individual task in the run sequence. In addition, we can break the whole sequence into smaller chunks for a more granular approach to creating and hosting the app. For example, we could set up a separate task called validate that runs the lint and test tasks. Or we could have a host task that runs server and watch. This ability to orchestrate tasks is very powerful, especially as your application scales and requires more automated tasks. This tells browserify to not use any plugins in production mode, and use hmr and watchify plugins in other environments. This PROD conditional is very useful because it saves us from having to write a separate gulpfile for production and development, which would ultimately contain a lot of code repetition. Instead, we can do things like gulp --prod to run the default task in production, or gulp html --prod to only run the html task in production. On the other hand, we saw earlier that littering our Gulp pipelines with statements such as .pipe(cond(!PROD, livereload())) aren’t the most readable. In the end, it’s a matter of preference whether you want to use the boolean variable approach or set up two separate gulpfiles. Now let’s see what happens when we keep using Gulp as our task runner but replace Browserify with Webpack. Now our full web app setup only requires five tasks instead of nine, a dramatic improvement. This means our gulp watcher isn’t triggering any type of rebundling behavior. As an added bonus, we don’t need to transfer index.html from app to dist or build anymore. Simple enough. Run the clean and html tasks in sequence. Once those are complete, grab our entrypoint, pipe it through Webpack, passing in a webpack.config.js file to configure it, and send the resulting bundle to our baseDir (either dist or build, depending on node env). This is a pretty large and intimidating config file, so let’s explain some of the important properties being set on our module.exports object. This sets the type of sourcemaps that Webpack will use. Not only does Webpack support sourcemaps out of the box, it actually supports a wide array of sourcemap options. Each option provides a different balance of sourcemap detail vs. rebuild speed (the time taken to rebundle on changes). This means we can use a “cheap” sourcemap option for development to achieve fast reloads, and a more expensive sourcemap option in production. 'webpack-hot-middleware/client?reload=true', // reloads the page if hot module reloading fails. This is our bundle entry point. Notice that an array is passed, meaning it’s possible to have multiple entry points. In this case, we have our expected entry point app/index.js as well as the webpack-hot-middleware entry point that’s used as part of our hot module reloading setup. This is where the compiled bundle will be output. The most confusing option is publicPath. It sets the base url for where your bundle will be hosted on the server. So, for example, if your publicPath is /public/assets, then the bundle will appear under /public/assets/bundle.js on the server. This tells the server which folder in your project to use as the server’s root directory. These are plugins that enhance Webpack’s functionality in some way. For example, webpack.optimize.UglifyJsPlugin is responsible for minification. These are loaders. Essentially, they pre-process files that are loaded through require() statements. They are somewhat similar to Gulp pipes in that you can chain loaders together. The test property tells Webpack that the given loader applies if a file matches the provided regex pattern, in this case /\.scss$/. The loader property corresponds to the action the loader performs. Here we are chaining together the style, css, resolve-url and sass loaders, which are executed in reverse order. Similarly, in our Header component we can add import './Header.scss' to import the component’s associated stylesheet. This also applies to all our other components. The URL loader instructs Webpack to inline our images and fonts as data urls if they are under 100 KB, otherwise serve them as separate files. Of course, we can also configure the cutoff size to a different value such as 10 KB. And that’s Webpack configuration in a nutshell. I will admit there’s a fair amount of setup, but the benefits of using it are simply phenomenal. Although Browserify does have plugins and transforms, they simply cannot compare to Webpack loaders in terms of added functionality. In this setup, we use npm scripts directly instead of relying on a gulpfile for automating our tasks. To run development and production builds, enter npm start and npm run start:prod, respectively. This is certainly more compact than our gulpfile, given we’ve cut 99 to 150 lines of code down to 19 NPM scripts, or 12 if we exclude the production scripts (most of which just mirror the development scripts with the node environment set to production). The drawback is that these commands are somewhat cryptic compared to our Gulp task counterparts, and not quite as expressive. For example, there’s no way (at least that I know of) to have a single npm script run certain commands in series and others in parallel. It’s either one or the other. However, there is a huge advantage to this approach. By using NPM libraries such as mocha directly from the command line, you don’t need to install an equivalent Gulp wrapper for each (in this case, gulp-mocha). I was a big fan of Gulp. But on my last project, I ended up with hundreds of lines in my gulpfile and around a dozen Gulp plugins. I was struggling to integrate Webpack, Browsersync, hot reloading, Mocha, and much more using Gulp. Why? Well, some plugins had insufficient documentation for my use case. Some plugins only exposed part of the API I needed. One had an odd bug where it would only watch a small number of files. Another stripped colors when outputting to the command line. I would tend to agree with all of these. Whenever a library such as eslint gets updated, the associated gulp-eslint library needs a corresponding update. If the library maintainer loses interest, the gulp version of the library falls out of sync with the native one. The same goes for when a new library is created. If someone creates a library xyz and it catches on, then suddenly you need a corresponding gulp-xyz library to use it in your gulp tasks. In a sense, this approach just doesn’t scale. Ideally, we would want an approach like Gulp that can use the native libraries. Although libraries such as gulp-plumber help alleviate this issue considerably, it’s nonetheless true that error reporting in gulp just isn’t very helpful. If even one pipe throws an unhandled exception, you get a stack trace for an issue that seems completely unrelated to what’s causing the issue in your source code. This can make debugging a nightmare in some cases. No amount of searching on Google or Stack Overflow can really help you if the error is cryptic or misleading enough. Oftentimes I find that small gulp libraries tend to have very limited documentation. I suspect this is because the author usually makes the library primarily for his or her own use. In addition, it’s common to have to look at documentation for both the Gulp plugin and the native library itself, which means lots of context switching and twice as much reading to do. It seems pretty clear to me that Webpack is preferable to Browserify and NPM scripts are preferable to Gulp, although each option has its benefits and drawbacks. Gulp is certainly more expressive and convenient to use than NPM scripts, but you pay the price in all the added abstraction. Not every combination may be perfect for your app, but if you want to avoid an overwhelming number of development dependencies and a frustrating debugging experience, Webpack with NPM scripts is the way to go. I hope you will find this article useful in choosing the right tools for your next project. Eric is passionate about web development and constantly strives to perfect his skills and learn the most cutting-edge web technologies. He is proficient in full stack development, with a specialty in front-end work using React, Node, and HAPI. Great article! Amazing writer!! Great Teacher!!! You demystified frontend project setup for me. Thanks a lot, God bless! Really enjoyed this article! Answered a lot of questions I've had between running task runners and bundlers. Definitely connected with that quote from Cory House’s post too. Sharing with the guys at work now! Bundling application and library dependencies into the same out-file does not make sense to me. As in a well organized C project, code imported from libraries (which are big and stable) should be compiled into one bundle and application code (much smaller and unstable) should be compiled into another. And the HTML should use two <script> tags. You can setup webpack to bundle vendor and project JS separately if that's your preference. And would you recommend webpack for Typescript code? I haven't personally used Typescript, but from a quick search it seems rather trivial to setup Webpack to support it. Basically just run Typescript code through a Typescript loader instead of a JS loader. I don't understand why you're comparing gulp+browserify to npm scripts+webpack instead of comparing npm scripts+browserify to npm scripts+webpack. gulp.watch() is also going to be much slower than using watchify or a tool that uses watchify like budo. I think it's hard to draw any conclusions from the characterization of the options presented in this article. Many thanks for this article, Eric! This has a lot of really useful information. Even though I've already heard about Gulp and Browserify, I didn't try them myself since a lot of people tend to use Webpack, specially in the ReactJS world. You were able to give enough information about those tools in such way I feel I'd be able to take a project decision based on your inputs. I hope you continue with this awesome content! Cheers! After running 'gulp' in the Gulp+Webpack setup (directly cloned from your repo), the 'dist' directory is created with only 'index.html'. There is no bundle.js or anything else produced. Am I doing something wrong? Thanks for the information. Will surely try Webpack + npm scripts in my next project. In the Gulp + Browserify scenario, why is "build" used for the directory when running in prod mode and the "dist" directory used otherwise? You mention "there’s no way (at least that I know of) to have a single npm script run certain commands in series and others in parallel. It’s either one or the other." It's actually possible to run npm tasks in series with the `&&` operator, and to run them in parallel (background process) with the `&` operator, eg. `npm run build && npm start` is a common way to run the build process and then start the server once it's done. `npm run lint & npm test` would run the lint process and the test process simultaneously. There's also an npm module called `parallelshell` which structures this nicely and gives you some extra control over how it works and it works with Windows as well as Unix. I was stoked when I found out about it, I use it quite a bit in my npm scripts so I hope it helps. 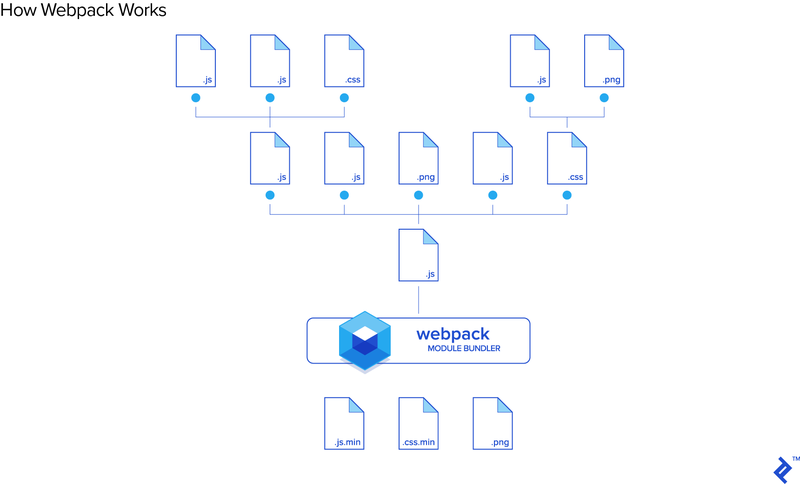 You missed out the fact webpack loaders have a similar story to gulp plugins, they're not well documented and a bit fragile as they don't often track with the latest updates to webpack. I think webpack is great if you don't do anything non-standard. He is already using parallelization through `npm-run-all`, which, unlike the 'put-stuff-in-the-background', actually gives you control over when a subprocess finishes, instead of forking. Seems to be quite similar to `parallelshell`. This article is quite disingenuous in how it compares the different solutions. Ooh, "webpack+npm are just 19 lines". Eh, no. What about the 65 lines of obfuscated webpack config? I scrapped Gulp for NPM scripts (and `npm-run-all`) a long time ago, but I stuck to browserify for its supreme easiness in piping into other commands. Browserify and uglify? That's <code>browserify app.js | uglify > app.min.js</code>. Low API threshold and gets the job done quickly. Our current webpack builds take 10-15 minutes. The complexity of Webpack has its place, but it quickly overwhelms a project. Webpack loaders also suffer the same problems as Grunt plugins: poor documentation due to one-offs for some itch that needed scratching. My usual conclusion: use NPM+Browserify for smaller projects that are less than 10 KLOC, possibly with a simple <code>build.js</code>. Webpack for multi-developer projects where using a days configuring it makes sense. Gulp 4 have great and simple task. Webpack is more configure than code solution. Gulp can be adapted to any framework. Less issues. Webpack standalone provide less possibilities and is too much opinionated. Thanks .It helped a lot. How do these two bundling solutions compare with Hugo, which builds static websites then watches the sources and rebuilds fast when needed? Hugo is written in a compiled language, for speed.